Centre d'Esports Sabadell Futbol Club, S.A.D. (Catalan pronunciation: [ˈsentɾə ðəsˈpɔɾ(ts) səβəˈðeʎ fubˈbɔl ˈklup] ) is a Spanish football team based in Sabadell, a city in the province of Barcelona in the autonomous community of Catalonia. Founded in 1903, it plays in Segunda División B – Group 3, holding home games at Estadi de la Nova Creu Alta . In 1933–34, the club won its first major trophy, the Catalan Football Championship, which allowed the winner to participate in the Copa del Presidente de la República . During the former tournament, it won 15 games and drew once, reaching the latter's final in the following season, losing 0–3 to Sevilla FC at the Chamartín Stadium. The Copa Catalunya is a knockout competition organised by the Catalan Football Federation for football clubs in the Catalonia autonomous community of Spain. The 1943–44 La Liga was the 13th season since its establishment. 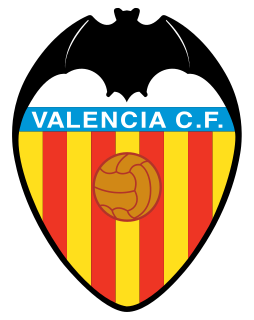 Valencia achieved its second title. The 1946–47 La Liga was the 16th season since its establishment. Valencia conquered their third title. In 1968–69, Sabadell, guided by manager Pasieguito, finished a best-ever fourth as the top flight already consisted of 16 clubs. Subsequently, it competed in the Inter-Cities Fairs Cup, losing to Club Brugge K.V. of Belgium in the first round (3–5 on aggregate); in 1972, a seven-year ran in the top division came to an end, as the Arlequinats were relegated after finishing dead last. Bernardino Pérez Elizarán, commonly known as Pasieguito, was a Spanish football player and manager. The 1969–70 Inter-Cities Fairs Cup was the 12th Inter-Cities Fairs Cup. The competition was won by Arsenal over two legs in the final against Anderlecht. It was the first of Arsenal's two European trophies, the other being the European Cup Winners' Cup in 1993–94. In the 2010–11 season, Sabadell, managed by Lluís Carreras, won its group in the regular season. In the playoffs, the team drew both games against SD Eibar, but was eventually promoted on the away goals rule following the 1–1 score at the Ipurua Municipal Stadium, returning to the professional divisions after 18 years. Sabadell had a lot of financial problems after the relegation to Segunda B. Japanese owner Keisuke Sakamoto, who had bought the club in 2012, sold it to Aragón-based company Viacron in 2015. Esteve Calzada, a former member of FC Barcelona board and a marketing expert whose company worked for Manchester City, bought the club in 2017. But the difficulties to find a new investor meant the team had more worries to avoid relegation than real hopes of promoting, which should be the goal for one of the clubs with a biggest stadium and a highest average attendance in the division. Sabadell plays home games at Estadi de la Nova Creu Alta . Inaugurated on 20 August 1967 with a 1–0 win against FC Barcelona, it has a capacity of 20,000 spectators. Club Esportiu Europa is a Spanish football team based in the city of Barcelona in the district of Gràcia, in the autonomous community of Catalonia. Founded in 1907, it plays in the Tercera División – Group 5, holding home games at Nou Sardenya, with a capacity of 7,000 seats. Josep Maria Fusté Blanch is a retired Spanish footballer who played as a midfielder and who was captain of FC Barcelona during the 1960s and early 1970s. In 1964, together with Luis Suárez, Amancio Amaro, José Ángel Iribar and his FC Barcelona teammate, Jesús María Pereda, he helped Spain win the European Championship. He also played for CA Osasuna and Hércules CF. After retiring as a player he worked as a public relations executive for Codorniu, a Catalan sparkling wine company. He also served as president of the FC Barcelona veterans association and publicly supported Sixto Cambra, a Catalan nationalist, who stood against Josep Lluís Nuñez in the 1989 FC Barcelona presidential elections. Josep Escolà Segalés, also referred to as José Escolà, was a Spanish footballer who played as a forward. He spent most of his club career at FC Barcelona. Escolà also played for both Spain and the Catalan XI. 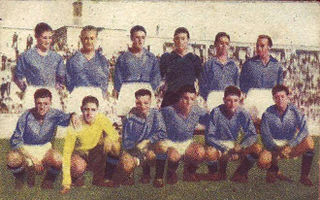 After retiring as player in 1948, Escolà managed CF Badalona, CE Sabadell FC, CD Castellón and Levante UD. José Gonzalvo Falcón, sometimes referred to as Gonzalvo II or –especially as of late– by the Catalan rendition of his given name Josep Gonzalvo, was a Spanish Catalan footballer and manager. Gonzalvo played for, among others, FC Barcelona, Spain and the Catalan XI. Reus Deportiu is a Catalan sports club best known for its professional roller hockey team based in Reus, Catalonia, Spain. Polònia is a popular comedy TV show broadcast in Catalonia by the public broadcasting TV3. The 2011–12 Spanish football season was the first for CE Sabadell in the second level since 1993, when the team was relegated for not paying its players. After a stunning season in Segunda División B, the team promoted via play-off and was runner-up in the overall season, being surpassed only by Real Murcia, who won on penalties in the play-off final matches. During early June, Joan Soteras confirmed that the team manager, Lluís Carreras renewed for this season after the rumors emerged in April that linked him with FC Barcelona B. The Premi d'Honor de les Lletres Catalanes is an award instituted by Omnium Cultural since 1969 to recognize a person by their scientific or literary work, written in Catalan language, the importance of their work and his/her significant contribution to cultural life of the Catalan Countries. L'Esquella de la Torratxa was an illustrated satirical weekly magazine, written in Catalan. Published in Barcelona between 1872 and 1939, it was well known for its pro-republican and anti-clerical stance and would become one of the most important Catalan publications of all times. Left Nationalists was a Catalan socialist and independentist political organization founded in 1979 from historical militants of the Socialist Party of National Liberation (PSAN), National Front of Catalonia, Catalan Communist Collective and independents linked to social movements. Its structure was based in local assemblies, and claimed the right to self-determination of Catalonia within a confederal Catalan Countries. NE also defined itself as national-popular and socialist. The party attracted activist from social movements, specially environmentalists, feminists, gays, youth, etc. The most representative were Jordi Carbonell, Josep Maria Espinàs, Magda Oranich, Avel·lí Artís i Gener and Armand de Fluvià. NE disbanded in 1984. The 1934 Barcelona City Council election was held on Sunday, 14 January 1934, to elect the Barcelona City Council, the unicameral local legislature of the municipality of Barcelona, together with the other 1,029 Catalan municipalities. At stake were all 40 seats in the City Council, determining the Mayor of Barcelona. These were the first local elections where women were able to vote. ↑ "Spanish Premier Division All-Time Table". www.rsssf.com. Archived from the original on 4 December 2012. Retrieved 3 May 2018. ↑ Martín, Luis; Congostrina, Alfonso L. (15 December 2014). "El C E Sabadell estudia expulsar a dos socios que realizaron gestos nazis". Archived from the original on 3 May 2018. Retrieved 3 May 2018– via elpais.com. ↑ "Sorry Lionel. We Made Plans – From Issue 14". standamf.com. 12 September 2015. Archived from the original on 3 May 2018. Retrieved 3 May 2018. ↑ "Un petit resum de cada grup - ask.fm/SpinnelliRudeBoy". ask.fm. Archived from the original on 11 February 2017. Retrieved 3 May 2018. ↑ SergiSBD (19 June 2009). "Nou himne del C.E. Sabadell 09/10". Archived from the original on 28 March 2016. Retrieved 3 May 2018– via YouTube.